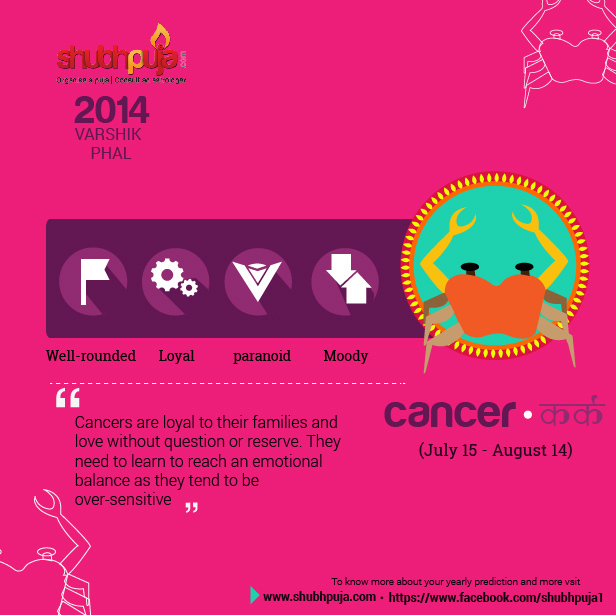 Vedic Astrology professes two types of Yagnas / rituals or tasks – the regular ones and the specific ones. The regular Yagnas / rituals are those which a person accomplishes on a daily basis. While the specific ones are often done to fulfil a particular wish. Wishes may be as diverse as of a child, wealth a long term romantic affair / stability in a love relationship, success on the business front or getting rid of certain diseases. In this way, the basis for performance of occasional duties may be anything related to a person or collective welfare. 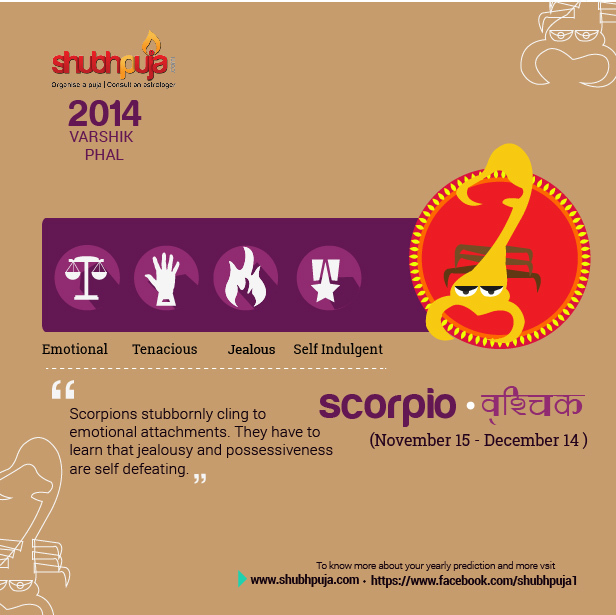 In such a situation, a person seeks the help of astrology when the desires are not completely fulfilled. A personalized yagna, however, is proven to be of immense help not only to restore your faith and belief but also towards your goal of wish fulfilment. We have, after some intense research included the five important aspects of life in these Yagnas: health, wealth, marriage, removal of obstacles and children. 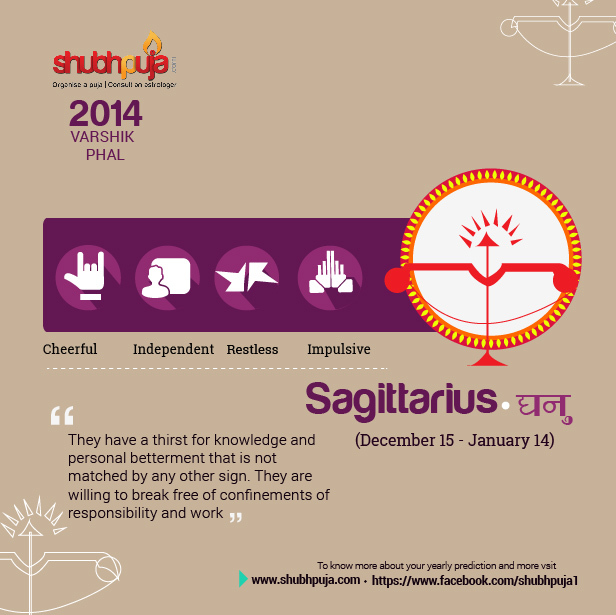 Astrology and Yagna, when done in correlation, promise a better and peaceful life to one. Be it any sort of relationship, disease or any other concern, the science behind a Yagna is so powerful that nothing can stand up to it. An analysis for the same is done when you contact our experts and then the ‘personalized’ yagna is brain-stormed upon and performed. 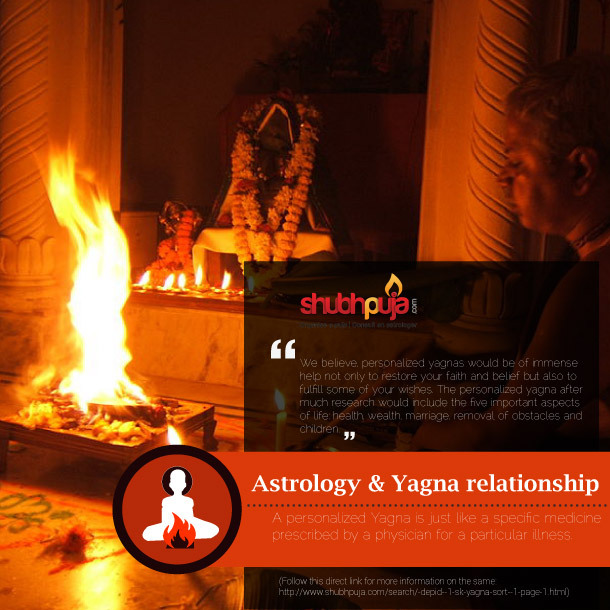 We at, www.shubhpuja.com, help you over-come all sorts of issues in your life through personalized Yagnas based on your astrology and sometimes just to attain inner peace. To rejuvenate your inner self completely, contact us now! This entry was posted in Consultants and tagged astrology, faith, Hindu, pandit, puja, religion, Shubh, shubhpuja, Veda, Vedic, Yagna. Bhrigu Samhita is the art of preparing the birth chart and we can, without any doubts, call it the Indian equivalent of the Zodiac Signs. “Janma Kundli” a complete scientific chart drawn with mathematical precision based upon the exact time that we were born is very popular amongst the Indians. It takes into account of all the planetary positions and their astrological influences at the different stages in our lives. This has been obtained off the Bhigu Samhita, which is an astrological (Jyotish) classic attribute to Maharish Bhrigu during the vedic period, treat yuga, although evidence available suggest it was compiled over a period of time by various shishyas of Maharishi Bhrigu. Perhaps the Bhrigu Shashtra set to have penned down by Shukracharya dictated by Rishi Bhrigu who was the master of Brahamvidya. The great Indian mythology says Mahariṣhi Bhṛigu insulted Lord Vishnu in some way which eventually crossed his wife- Goddess Lakshmi who also happens to be the supreme goddess symbolizing prosperity, wealth and fortune. She cursed Maharishi Bhrigu — that he and the community he represented (the Brahmins) will be parted away from wealth. After great triumphs of apologies, the Goddess suggested him to share his Astrological vidya so that his Brahim counterparts and generations to come shall be benefitted. 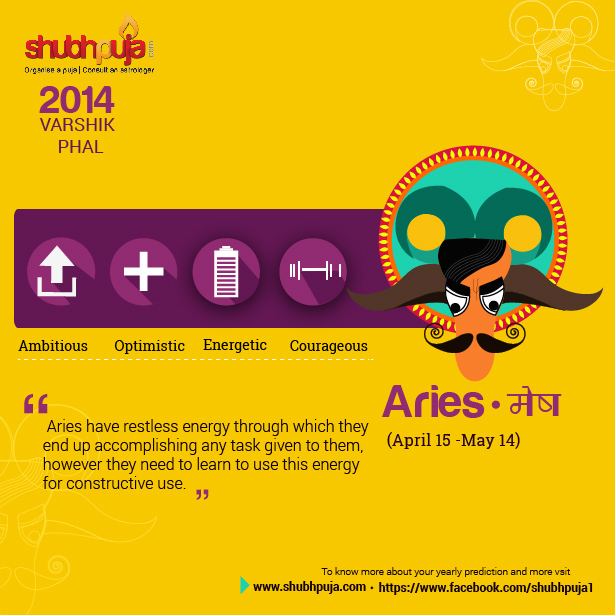 Maharishi Bhrigu became the first compiler of predictive astrology by compiling about 500,000 horoscopes. His database formed a base for further research and study. This study culminated in the birth of the science (Śāstra) of determining the quality of time (Horā) and is the Bṛihat Parāśara Horā Śāstra. Maharishi Bhṛigu gave his predictions on different types of horoscopes compiled by him with the help of Lord Gaṇeśa in a brief and concise manner. These Horoscopes were based upon the planetary positions of the Sun, Moon, Mercury, Venus, Mars, Jupiter, Saturn, Rāhu (North Node of the Moon) and Ketu (South Node of the Moon). The total permutations/possible horoscope charts that can be drawn with this is about 45 million. Maharishi taught this art of predictions to his son (Śukra) and other pupils and that’s how it became a legacy and continued. The amazing accuracy of the predictions that the Bhrigu Samhita contains attract all, the rich, the poor, the educated and the un-educated since times immemorial. People in millions have been benefitted with the readings of this Granth. We at www.shubhpuja.com understand, however, that not all of us have the time and room to read the granth and utilize for our greater good. Therefore, we bring you the benefits of the same by the research and the reading that we’ve done. 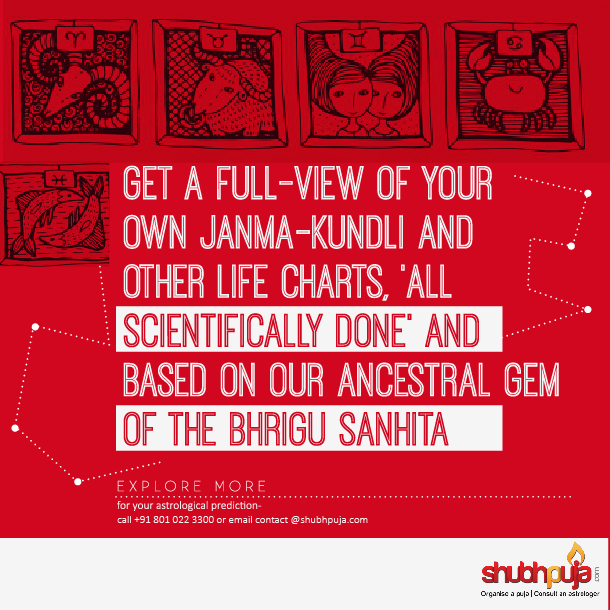 Visit us, consult a pandit and get a full-view of your own janma-kundli and other life charts, all scientifically done and based on our ancestral gem of the Bhrigu Sanhita. This entry was posted in Consultants and tagged astrology, Bhrigu, Bhrigusamhita, Brahmin, faith, Mythology, puja, religion, Samhita, Shubh, shubhpuja. 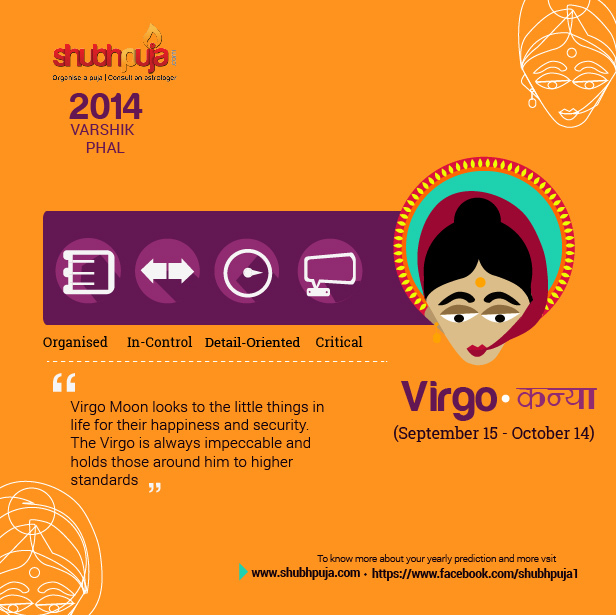 Vedic astrology is accurate and true because it divined by Shrimukh at the time of the creation of this universe. The Jyotisha Shastra states, SAPHALAM JYOTISHAM SHASTRAM CHANDRARKO YATRA SAKSINAU, which means- “As long as the sun and moon shine in this creation, the science of astrology will remain fruitful.” To correctly calculate a person’s astrological predictions, it is best to give predictions by using the person’s exact birth date, time and place. Astrology consists of a number of belief systems which hold that there is a relationship between astronomical phenomena and events in the human world. Each person’s life, fortune and its nature is foretold differently, even though they may have been born under the same star. It is because even though a person may have taken his/her birth under a particular astrological star as many others have, they will have different horoscopes because an astrological star stays for a period of time, whereas the astrological planets for a particular star change in minutes. 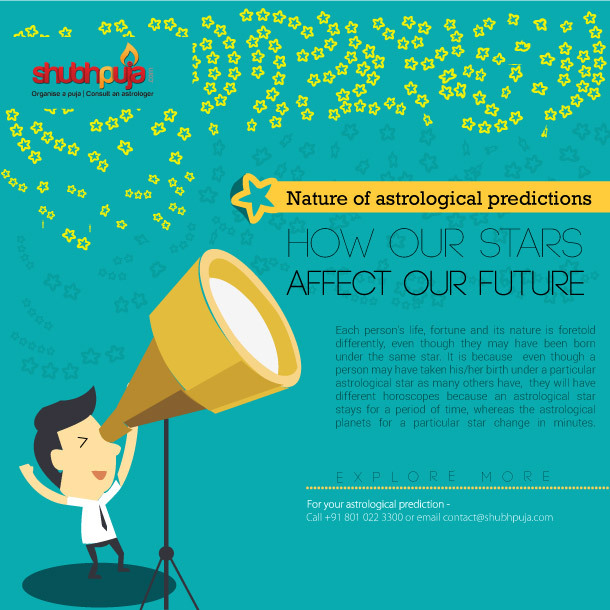 Though it is important for one to understand, that astrology cannot make precise predictions about your future, it cannot tell you when you will wake up tomorrow when will you trip off the stair-case, but astrology sure will reveal the tendencies of your future. The difference is that an astrologer can tell you about the possibility of some upcoming danger in your life but might not be able to just spell it out. In any case, however, it is always best to find a qualified astrologer and give them your exact birth date and time to obtain your correct horoscope predictions. 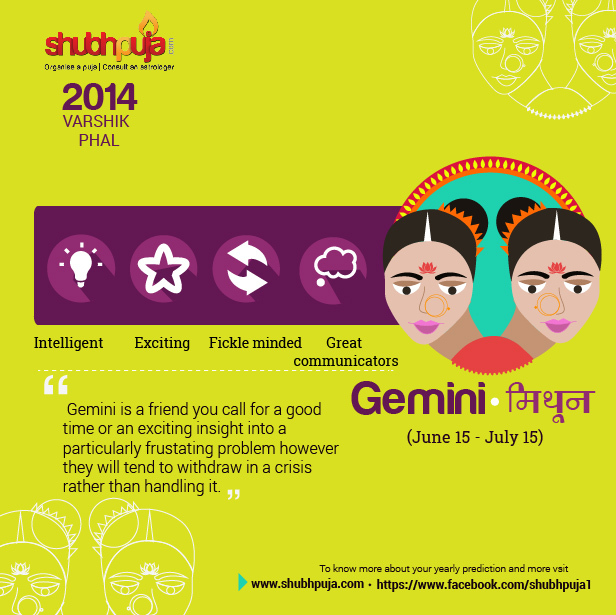 Like with us, at www.shubhpuja.com, where we put in all our vidya to come up with nothing but the best to give you the most accurate predictions about your future, money, fame, inner-self and all your life. So take advantage of this science and make your future brighter by receiving forewarning about the upcoming problematic period in your life. This entry was posted in Consultants and tagged 2014, astrology, faith, HappyNewYear, Hindu, hinduism, Mantra, predictions, puja, religion, Shubh, Stars, World. Vedas & Science – Are Vedas the first scientific treatise in the world? 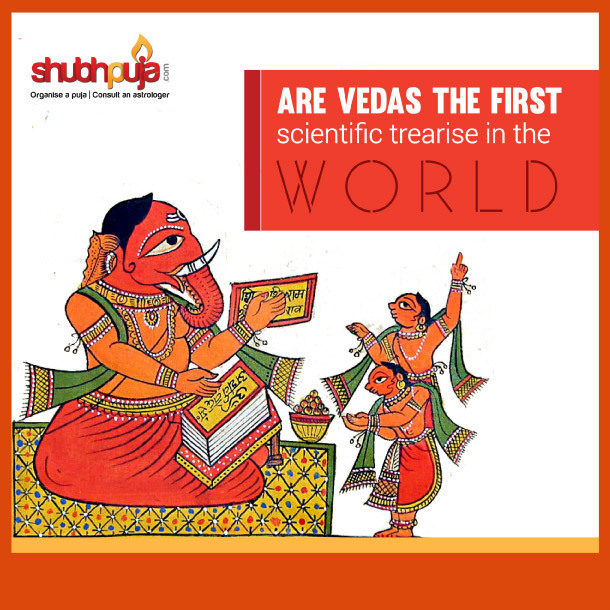 Are vedas the first scientific treatise in the world? In India, Science and Spirituality have always gone hand in hand. Spirituality has been taken as a path to conceive any sort of sciences. Its major attributes, Yoga & Vedanta have always been a way of approaching knowledge by attainting the required inner-peace, serenity and experimentation. The finest example of the same, Vedas, are at the base of spirituality as well as the sciences in our country. Veda, in itself means Knowledge. There is a whole different branch pertaining to sciences that Vedas contain. These are also popularly known as Vedic Sciences. Vedic Sciences may refer to a number of disciplines: ancient and modern, scientific, metaphysical, proto-scientific, found in or based in the Vedas. Vedic Sciences do not recognize just the universal consciousness as a background but a cosmic intelligence and a universal life force to explain how absolute consciousness is connected to our world of ordinary experiences. Any modern scientist would rest his/her logic upon the conscious of being through something which can clearly be known. Vedic sciences however, recognize the importance of sensory perception and reason; it considers that there is clearly another, more reliable source of knowledge, the internal knowledge. Today with clear vision it is easy to recognize that the true light of the Absolute Truth has indirectly shone upon many walks of modern life. From ecology to filmmaking, culinary habits to so called New Age philosophical views, from yoga-inspired healthy habits to the very language we speak, the influence of India today is omnipresent. It is now only upon us to exploit it to the fullest when we have such high form of sciences at our disposal, which are, in fact, the basis of the very modern science which has become an integral part of our lives. We, at www.shubhpuja.com present you with the same high order sciences to know about your life, future, career, marriage and improve personal and professional aspects of our life. This entry was posted in Astrology, Puja and tagged 2014, astrology, faith, HappyNewYear, hinduism, Mantra, puja, religion, Science, Scientific, Shubh, shubhpuja, Vedas, World. Have you ever wondered? Why do some relationships work and others fail? Why do you almost immediately like some people, but can’t figure out why you can’t get along with others? Why do you get the feeling of “fitting” with someone, even when it appears by worldly standards that you do not? These questions and many such other questions can be answered by learning about the interrelationships of energy patterns called vibrations, which makes up every individual’s body and personality. Numerology, the Science of numbers can be used to decode the trends of an individual’s life events and to predict the future aspects that can be determined through an individual’s numerological patterns. It helps an individual understand themselves and take necessary actions in future to play on their strengths and improve on their weaknesses. 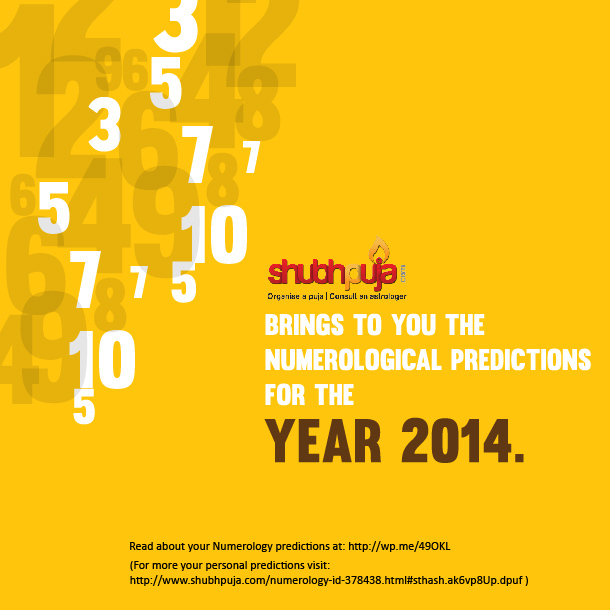 www.shubhpuja.com brings to you the Numerological predictions for the year 2014. These insights give an over-all an edge over others and help them achieve success, happiness and fulfillment in their daily lives leading them to the path of personal and professional success. 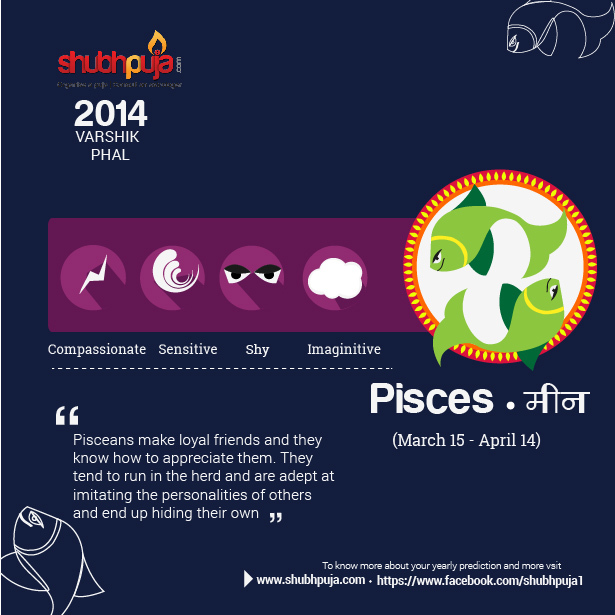 Here, number 7 is ruled by planet “Ketu” in Vedic Astrology and Neptune in Western System.  2014 Focus Areas: New Inventions, discoveries, Spiritualism, Research, Religion, Occultism , Global Warming ,Natural Disasters like floods, hurricane, super storms & typhoons .  The year 2014 = 7, is one of the most important spiritual number and is analytical and self-examining . The 7 is considered to be the bridge between Heaven and Earth. Spending time in nature, practicing meditation and yoga and approaching your life on a holistic level would be beneficial activities for 2014.  2014 is a tremendously important year in regards to evolving our collective consciousness. It is a year that emphasizes dreams, messages, psychic phenomenon, wisdom and our connection to the Divine. It has been said by many in the spiritual field that the energy we are currently experiencing on the planet requires us to evolve in spirit. Those who have been doing the spiritual work will be better equipped to handle the energy of the 7 Universal Year but those who have not will struggle. We may see many more people become mentally unbalanced and unfortunately that will translate into physical acts involving violence. Depression, loneliness, mental illness, alcohol and drug abuse is likely to increase.  There will be people in power, who change overnight, and institutions that will reconsider their ideologies, giving us hope … but we will also see the negative forces become more desperate and violent. In the chart below, which breaks down the year 2014, the numbers in the upper half show the positive influences of this 7 Universal Year, which are found by continuously adding the digits in a pyramid-like system. The numbers in the lower half show the negative influences, and are the result of subtracting. They are therefore mirrors of each other. The strongest relationship any one number in this chart has is with its mirrored partner. The 9 at the top represents compassion and empathy, while the negative influence of its mirrored partner, the 1 at the bottom, reflects egotism and cruelty. The contrast is obvious and appropriate. The 3 and the 6 in the upper half tell us that art and communication (3), and a deepening sense of responsibility (6) will be the primary channels through which the energy of the 9 flows in 2014, while their mirrored partners, the hostile 1 and the sly 2, oppose them. The 5 represents a big change or shocking and unexpected event around October or November of 2014, caused in large part by miscommunication (the 3 below it). The Numerology influences of the year 2014 affect each of us differently, depending on your personal cycles, which are linked to your Personal Number. Method for finding Personal Number: Day of birth+ Month of birth. This year gives you relief. This year you will have an opportunity to involve yourself fully in work and material growth and bring home the rewards. You get breakthrough in unfinished projects. Give in to your ambitions — you will find yourself more clear and focused and able to pursue and reach your goals. Your power is visible and strong, mental creativity is high, vision and intuition will guide you, and you are more efficient and focused through 2014. Year is full of “Money Rewards” and “Name and Fame”. January is a month when your energy is lower than usual, but that changes at the beginning of February. 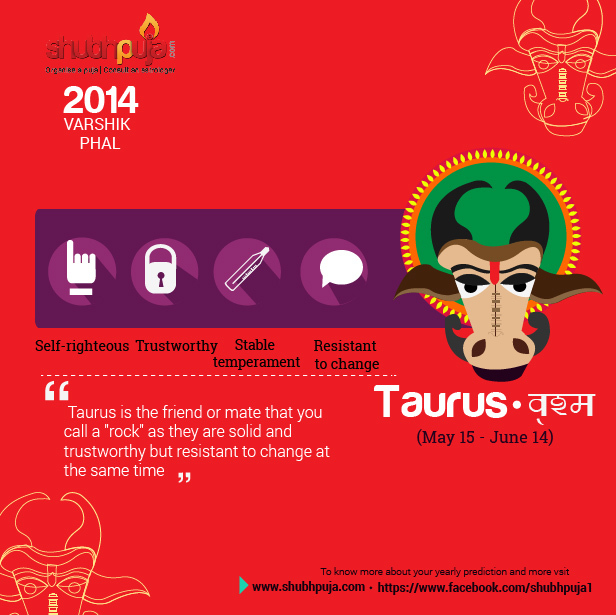 June is particularly hectic and may bring a change in environment, a move perhaps. October brings a new venture. This is your year to finish up all unfinished business, to clean house and make room for new things. On a material level, this is a good time to get rid of unnecessary weight, to give away or sell what you do not need anymore, and to pay off old debts. On a spiritual level you will experience a different mode altogether. Your attention should turn to others and their needs. Find ways to be of help and give time and energy to worthwhile causes. Problems can be solved, strained relationships relax or disappear, and the sources of stress in work or business can be better understood and dealt with. There can be some difficulties this year due to your desire to face obstacles and overcome them. Decisions have to be taken and courage and strength may be severely tested several times. May is your most dynamic month, while June and July find you a little worn out. After all, this is the end of a nine-year cycle, and your energy level is a little low. August is invigorating, but a month to pay special attention to financial matters. November brings romance and commitment to the foreground. Be ready for major changes in 2014. You will be inspired to start new projects or enterprises, and will feel a strong forward push toward new goals. This is a time for vision and planning. Share your dream with others: make plans, get the necessary support, but, above all, rely on yourself as the driving force. Be decisive! This is also a good time to make the personal changes you have long wanted to make: start a diet and/or an exercise program, or begin a new course of study. There will be considerable emotional turmoil, especially in the first two or three months. Be open-minded, organized and focused. Avoid distractions and procrastination. March is a key month when you are able to lay the foundation for your plans. April brings a change of residence, office or career. In July and August you see the fruits of your labors begin to take place, while October represents a change in a personal relationship, most likely romantic. You are entering a 2 Personal Year cycle, a year to carefully protect and nurture your plans. You will be like a mother watching over her children, conscious of every threat, real or imagined. You need tact and cooperation to keep yourself moving forward. There will likely be confrontations with others, requiring a subtle and gentle approach. You will have to stay focused on your goals, and use intelligent persuasion. You will be unusually sensitive this year, and may wonder at times what happened to the drive and momentum you felt last year. May is the pivotal month in the year for you. You are extremely intuitive and sensitive, and better able to influence your peers and your circumstances. July brings a culmination of plans and a distinct step forward. August sees things become more concrete and brings a new beginning. September is emotional, requiring adjustments, tact and inner resolve. Your Personal Year cycle is 3 in 2014, making this a year of expansion and personal growth. It is a time of heightened personal expression. Creativity comes to the forefront, and you are more lighthearted and drawn to social events. Your challenge is to avoid scattering your energies. You have a rare opportunity to bring forth new and original ideas. But that requires discipline and focus. It is easy to be optimistic and enthusiastic this year, and this may result in speeding up your projects. This is often a good financial year, particularly if your creativity is well directed. You communicate well this year and are more capable of getting across your ideas. This is a year to be organized and practical, and take care of details. Your concentration and ability to focus will be much improved over last year. There can be a sense of limitation and some frustration this year too, though. However, it is a year of important opportunities that must be seized. 2014 is a good year to buy real estate or remodel your home. It is also good times to take care of projects which have been postponed for too long. January and February will bring some important change, a new opportunity perhaps. March requires self-reflection and reshaping of your plans. October brings changes and a sense of chaos. But November brings assistance in the form of a promotion or additional financial support. This is a year of dynamic change. Many surprises will come your way, so be open and ready to embrace new opportunities. This is a year in which a major step forward can take place if you are willing to take some calculated risks and do a little gambling. This is an exciting year in which you are required to promote yourself in order to take full advantage of the opportunities that await you. There will be increased opportunity to travel and possibly a change of residence. It is a rebirth and a release after last year’s struggle. Change takes place consistently, and particularly so in April and May. July is a breakthrough, a time to enjoy life. 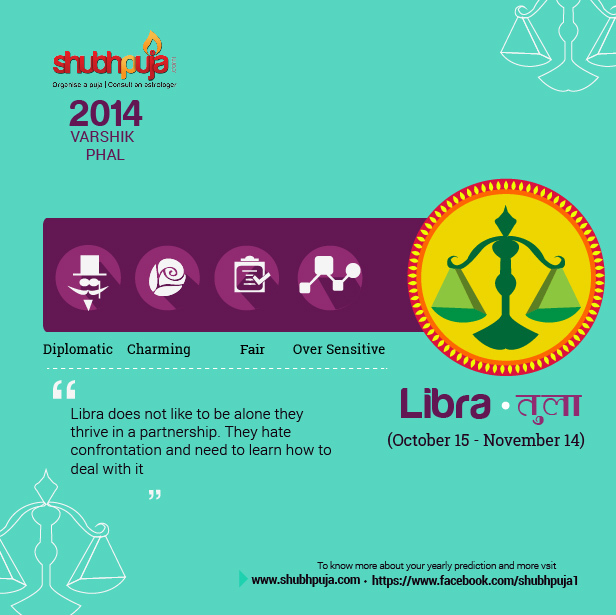 September can be intense, while October requires tact and balance in relationships. Your Personal Year for 2014 is 6, making this a year of progress and financial advancement. Major career opportunities present themselves now. It is a challenging year in which personal growth is joined with new responsibilities and challenges. This is a year of domestic responsibility and attention to the needs of family and friends. It is also often a time when marital issues surface and need attention. May is an emotional month filled with the promise and the stress of imminent changes. June is a breakthrough and a relief. September brings advancement, but it can also bring health issues to the foreground. October is about self-reflection and readjustments, and December brings a sense of completion and fulfillment. You experience a strong tendency to spend more time alone in 2014, to delve inside and find some answers and to reach a better understanding of yourself. Improve the quality of your life in 2014. Rest and attend to your health. It is during this year that you strengthen the foundation of your life; after all, your success in all matters rests upon the strength of your inner self. January and June are exceptions and do require you to pay attention to your business or career, as well as finances. September gives you a window into your future, while November and December give you a boost in energy that continues into 2015. So now you see what it is all about. 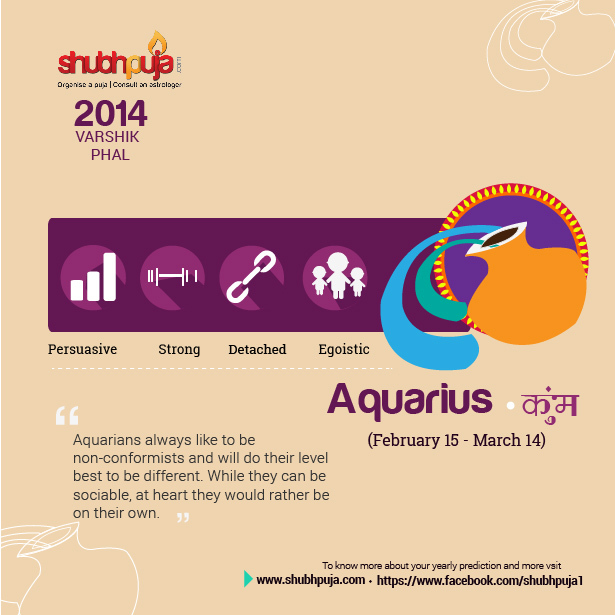 We at Shubh Puja, also provide astrological services to people living in India and abroad. Here we have a mix team of highly successful professionals (with knowledge of astrology) and educationally qualified shastris in Jataka Shastras who have given advice to various individuals and made them a personal and professional success. We have the top-most astrology/numerology experts on our panel. These experts are personal advisors to top-most politicians and industrialists all over the world. A comprehensive and personal analysis through “Prashna Kundli” (answering direct questions of clients) instead of a standard and unrelated computerized report through inaccurate software. In order to achieve “BALANCE” in one’s life, we at Shubhpuja.com; ensure you the best and unique solution for your day to day problems by innovative methods. So what are you waiting for! A brighter future awaits you; we can only be your guides and help you find that direction to attain that balance. This entry was posted in Astrology, Numerology and tagged 2014, astrology, chart, faith, future, newyear, numbers, numerology, Personal, predictions, puja. 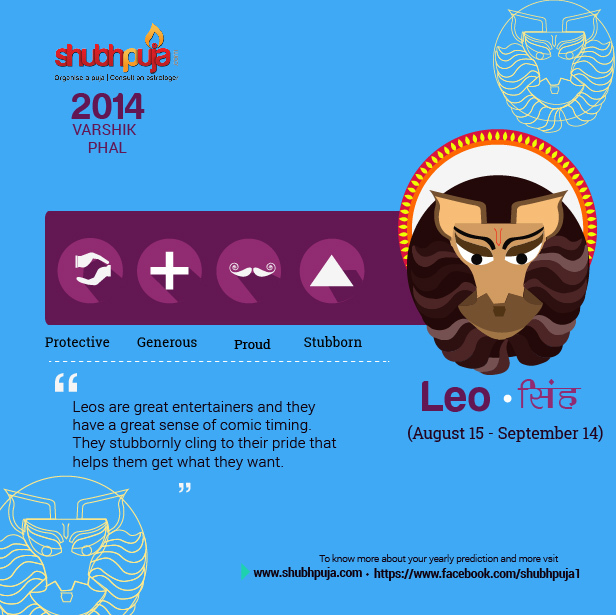 This entry was posted in Astrology and tagged 2014, astrology, facebook, faith, horoscope, insight, newyear, Rashee, shubhpuja, Varshphal. 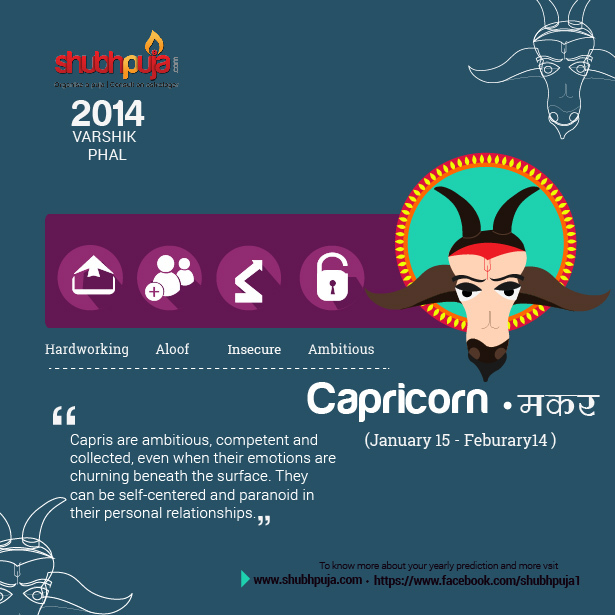 This entry was posted in Consultants and tagged astrology, fortune, future, god, happiness, horoscope, newyear, Planet, puja, shubhpuja.